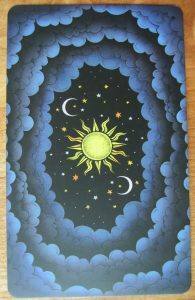 The Dark Mansion Tarot is an independently published deck by Krzysztof Wasiuk and Magdalena Kaczan (artist). 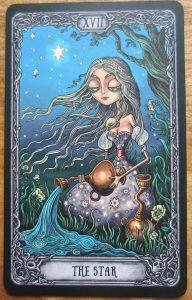 Based on the Rider Waite style, this is a high quality, one of a kind Tarot deck, reminiscent of Tim Burton movies. At the time of this review, it comes in three different versions – standard version, limited edition and large edition. Warning: this is as close as I’ve come to finding the “perfect” Tarot deck! I first unboxed this deck on Christmas Eve after I’d enjoyed a delicious holiday dinner with my family. I’d just had a few tokes and was high as a kite when I first laid eyes on these cards. As I looked through the deck like a glassy-eyed zombie, I thought oh my god! This deck is incredible! It feels like butter in my hands, ooooh! The cards seemed to be speaking directly to that place inside me where my mind and soul meet. It was a magical experience. I was on the cusp of a full blown Tarotgasm! Then I thought I’m probably just high, I bet it won’t be as spectacular tomorrow. But I was wrong. The next day I looked at this deck while I was stone cold sober and still thought oh my god, this is one of the coolest decks I’ve ever seen! I have the standard version, which is what my review is based on. This deck also comes in a fancier limited edition which has larger cards, thicker card stock and a fancier, velvety finish and comes in a wooden box. There is also a large version. Honestly, the quality of the standard version is so good, I can’t imagine needing an even better quality version, but it’s there for you if you want it. Box – the deck comes in a sturdy, cardboard box (pictured at the top of this page). It’s a nice, pretty box that is perfect for storing your cards in. Card Stock – Superb! Good quality, luxurious card stock with a lovely matte finish. Print quality is top notch and the colors really pop. One nice thing I noticed – unlike my other decks that have a black background, this deck doesn’t get the little white chip marks on the edges. I’ve been shuffling and using these cards quite heavily for over a month now and they are still black as night! Card backs – I love the card backs so much! They are cute and mysterious all at once (see below for a picture). Size – Cards in the standard version are 12 x 7.4cm (a nice size for shuffling). I’m interested to see what the large version is like as I love big decks for their view-ability, but like smaller cards for their shuffle-ability. LWB – there is no little white book with this deck. I really, really, really love the style of the art. Artist Magdalena Kaczan has done an outstanding job here. This deck feels like it was well thought out and meticulously crafted with lots of attention to detail. I know a deck is special when each card just radiates a particular vibe or persona and with The Dark Mansion Tarot you really do feel like you’re entering into some other world when you’re reading with it. The art reminds me a bit of Tim Burton movies, especially The Nightmare Before Christmas (one of my faves!) as it has this really cool atmospheric, Halloweeny feel to it, but not in an overpowering sort of way. How does this deck read? Like a charm! I used this deck for my 2019 Tarot forecast reading and I used it steadily for most of the private readings I did in January, as well as my own personal readings. 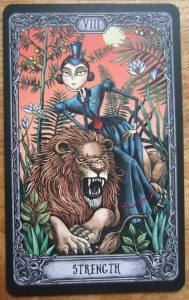 The Dark Mansion Tarot sticks close to the Rider Waite style imagery, making it feel familiar and very easy to read with. I especially liked the Court Cards, which were brimming over with personality and spark. Court Cards can be tough to read, but I found them a joy to read in this deck. Who is this deck for? Everyone. Beginners will have an easy time due to the fact that it’s similar to the Rider Waite in terms of symbolism and imagery. But this is no boring, Rider Waite clone, so I’m sure seasoned Tarot fans will find much to love about this deck! I’ve seen a lot of Tarot decks over the years and I’ve become a bit jaded and numb. 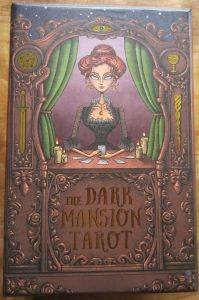 I rarely get all heart-pounding excited about a deck – but I sure did when I saw The Dark Mansion Tarot. This one’s special and I know it will be one of the most used decks in my collection. This entry was posted in Deck Reviews, January 2019. Bookmark the permalink. Placed my order last week. I’m sooo excited to receive this deck…it can’t get here fast enough…LOL! These are beautiful! Thanks for sharing your thoughts on them too. Definitely will be ordering my own deck! Absolutely gorgeous! But I don’t know if I could pay that much for a deck. But I really want them! Wah. Thanks for the video. Yeah, I hear you! I feel like in this case, they are totally worth it. This is actually one deck that I would feel okay about splurging on. My mind is made up and i am ordering a deck! Thanks for helping make my mind up! Fab. Yay! Hope you like them as much as I do!